Join us most Saturdays for Mini-Workshops. We teach a variety of projects and most of the workshops are priced, including materials, under $20. You will generally learn a new skill to add to your repertoire or you will just have a lot of fun with fellow beaders learning a new project. Mini-Workshop Cancellation Policy – We offer very low cost mini-workshops to share creative ideas and to increase store traffic. Workshops are paid in advance and seating is limited. Much like a theater or concert ticket, there are no cancellations or refunds. Students must adhere to the product purchase requirements and class instruction sheets are for class participants only. If for any reason you are unable to attend, you may send another person, 18 years of age or older, to take your place. 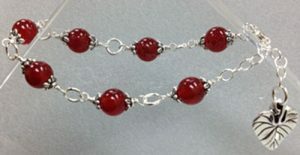 In this class the student will learn the basics of wire wrapping by completing a bracelet. Pre-registration is required and all materials must be purchased at Ruby Tuesday Bead Company in advance of the class. The student must provide their own tools. Please call 562-498-2700 to register. This class is taught on the Knotty-do-it-all® board. 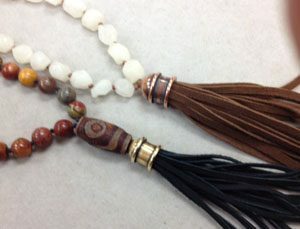 You will learn tassel making and how to knot a beautiful mala style necklace. Pre-registration is required and all materials must be purchased at Ruby Tuesday Bead Company in advance of the class. Cancellation Policy for classes other than Mini-Workshops – We require a 72 hour (3 days) notice of cancellation prior to the start of class to receive credit towards a future class. We do hire a teacher or staff to specifically come in to teach the class and our classes are small so this enables us to reschedule the available spot or cancel the class. No Show = No Credit.